Climate Interactive and C-ROADS have recently been featured in a blog post by Adam Hasz of the Washington University Students for International Collaboration on the Environment (WUSICE). The post discusses our C-ROADS model and resources, in relation to their “U.S.-China Student International Conference on Climate Change and Sustainability”. Of particular relevance is our C-ROADS documentation in Chinese, which was developed to support our partnership with Tsinghua University. Check out WUSICE’s post below or view the original here. Hi everyone. My name is Adam Hasz, and I am a third year student at Washington University. I am studying environmental studies and urban studies, and am particularly interested in sustainable development and ways in which we can collectively work towards stabilizing our planet’s climate. I have been very active with Green Action, the environmental activist group on my campus, and have helped to coordinate several demonstrations against coal companies and other dirty energy corporations. In addition, I have been involved with 1Sky, the Energy Action Coalition, the Missouri Student Environmental Coalition, and the Sierra Student Coalition. I want to share something that I hope will be very useful during our conference: C-ROADS, an interactive climate model used to calculate the long term results of various global climate commitments. C-ROADS is part of the Climate Interactive project developed by MIT System Dynamics guru John Sterman. C-ROADS was first used at the COP15 Copenhagen Negotiations to immediately show delegates the long term consequences of their proposed policies. While the actual C-ROADS negotiating software is not available, a simplified simulation model is available to the public through this link. I hope that we can use this model during our own negotiations, and hopefully create policies that lead to a safe level of atmospheric greenhouse gas emissions. Climate Interactive has many resources available on its website to help global citizens understand the C-ROADS model, the dynamics of climate change, and how progress on this issue requires international cooperation. 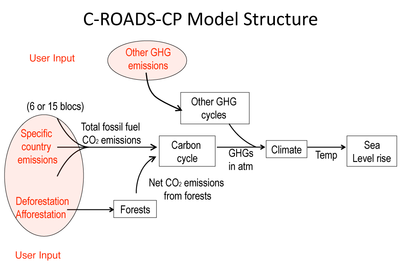 In addition, Climate Interactive provides C-ROADS materials in Chinese, which Fudan University students may appreciate. The latest model results from August 31 (which use the most up to date international pledges) do not look promising. Currently, we are on a path towards 840 ppm of CO2 by 2100, which places us very high above the threshold of dangerous anthropogenic climate interference. We need a dramatic shifts in emission commitments from the international community in order to prevent drastic changes to the global climate system over the next century. But there is hope. We are that hope. Continued disagreement between China and America in regards to fair GHG emission reductions has been one of the major roadblocks in creating a unified global climate treaty. Through the WUSICE US-China conference, we can work to build a bridge of trust, solidarity, and cooperation between Chinese and American youth. Together, we can push our leaders to take bold action at the domestic and international levels to address climate change and usher in a new era of sustainable prosperity. C-ROADS shows we still have a lot of work to do to ensure a stable climate and create a sustainable society. But I am confident that humanity is up to the challenge, and that youth will lead the way.